Young children can explore a bustling medieval castle in this charming, lift-the-flap non-fiction book. Flaps and peep-through holes in the pages reveal a knight putting on his armour, castle guards counting the king’s treasure and a grand feast with the royal family. A lovely introduction to a popular historical subject for little children. 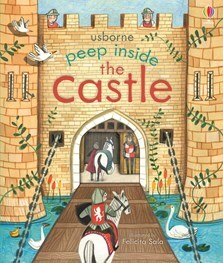 There’s lots to explore in this charming, lift-the-flap non-fiction book about life in a bustling medieval castle. It’s not only educational and fun, but it also feels lovely in your hands and is a top quality book. It would make a perfect present for a little person. We absolutely loved this delightful book and would highly recommend it. It is a perfect book for young children with sturdy pages and lots of flaps to lift up. The illustrations are really stunning... This is one of our favourite picture books of the year so far. Like all Usborne books, it is beautifully illustrated... another fab offering from Usborne!